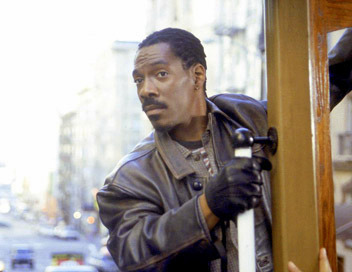 On the look-out for Tenderloin trannies. I live a block down from one of the steepest hills in the City, Jones between California and Pine. Tourists are constantly photographing it but I know from experience that the pictures just don’t turn out. You can’t capture the incline or the depth for some reason, it always looks flatter than it is. 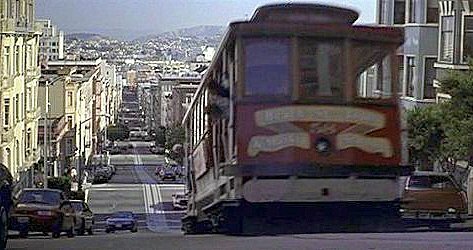 When they were filming the Eddie Murphy film Metro in 1996 they decided to use this hill for the runaway cable car chase scene. And I watched the whole thing from my bay window. There are no tracks on this part of Jones so they painted fake ones down the middle of the street and used motorized cable cars. They also turned it into a two-way street for the movie, in real life it’s one way downhill. And even more dramatic license: you never, ever allow parallel parking on a hill of this grade but they did. To enhance the chase a plywood ramp was built at the intersection of Pine and Jones to film a car jumping on to my block. That was exciting to watch, the rest of the two-day shoot was pretty boring. Hill is real, cable car is not. 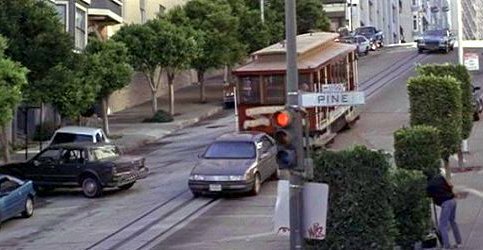 They did some close-ups of Mr. Murphy in front of my building but when they shot the actual speeding cable car it was filled with extras. I enjoyed watching the non-speaking actors who played pedestrians across the street from me. It took hours to set up the runaway and they spent most of their time conferring and blocking off their movements. They were dead serious about their craft. In the movie they were on the screen for about 3 seconds. As I’ve told cab drivers thousands of times over the years, mine is the third building on the left after the intersection.